“We have done a presentation in Tokyo” Good morning. It is already August. 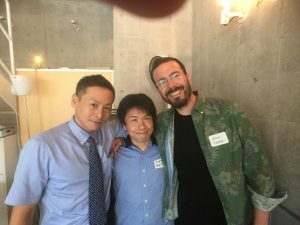 Yesterday, at Kibidango, Inc. in Tokyo, we did a presentation for Julio Terra and Sean Leow of Kickstarter who came to Japan from the US. 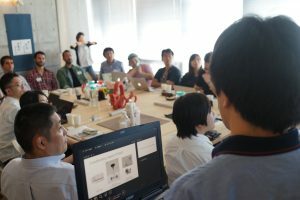 KeiganMotor is planning for crowd funding with Kibidango and Kickstarter. We received feedback after the presentation. The outcomes were, “it is better to conduct PR with a narrow focus at the beginning” and “it will be more effective to have, if possible, a blogger or someone who can be an influencer, to use the module and spread the word.” We got positive feedback about the product — “It’s very cool.” We would like to take note of this, as it is the opinion of one who has actually seen many case studies. With regards to PR, as we are also thinking of actually going to the US for publicity, we are thinking of proceeding with it as a project. 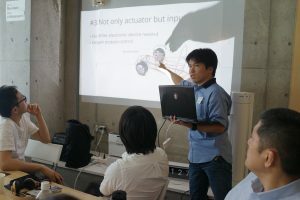 It was at short notice, but we are thankful to all, Mr. Aoi, president Matsuzaki, and the staff of Kibidango, Inc.
As we have received a new prototype at the end of last week, we will keep doing our best. (The photo is from the occasion).